There are those who normally play a leadership role in society by representing the community. Such representative characters are those leaders who perceive the ideals, principles, and qualities that are desired and admired by a community or nation, and translate them into concrete programs of life and culture. Their importance cannot be underestimated since they play a major role in the progress of any community or nation. The problem today is that the relationship between these figures and their communities has been broken. The decline of civil life in the last decades has led members of communities to no longer think in terms of society but in their isolated individual lives. 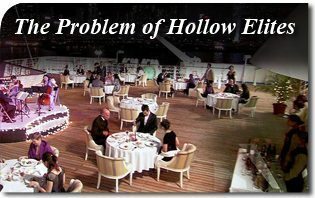 However, what has been especially devastating is the role of what sociologist Charles Murray calls “hollow elites.” These representative figures often live financially successful lives, but are dysfunctional in relation to their social responsibilities. Murray notes that, “They have abdicated their responsibility to set and promulgate the standards. The most powerful and successful members of their class increasingly trade on the perks of their privileged positions without regard to the seemliness of that behavior” (Charles Murray, Coming Apart: The State of White America 1960-2010, New York: Crown Forum, 2012, p. 294). In other words, Murray claims American society is coming apart because both the members of communities and hollow elites have failed in their responsibilities. This failure underscores the need for a return to order. This entry was posted in Fighting the Culture War and tagged behavior, community, culture, elites, fight, figures, hollow, leading, Murray, nation, new, problem, relationship, representative, role, society, sociologist, TFP, york by John Horvat II. Bookmark the permalink.